Hidden French Fine Dining at Café Claude in Union Sq. I get strange cravings sometimes. Escargot and Beef Tartare probably are not the first things you’d think of having on a hungover Saturday solo lunch, but I guess I’m a little different than most people. I knew what I wanted and I knew where to go to get it, so I took a fifteen minute walk from my Union Square hotel on a very grey, rainy San Francisco day to quench my thirst for fine French cuisine. 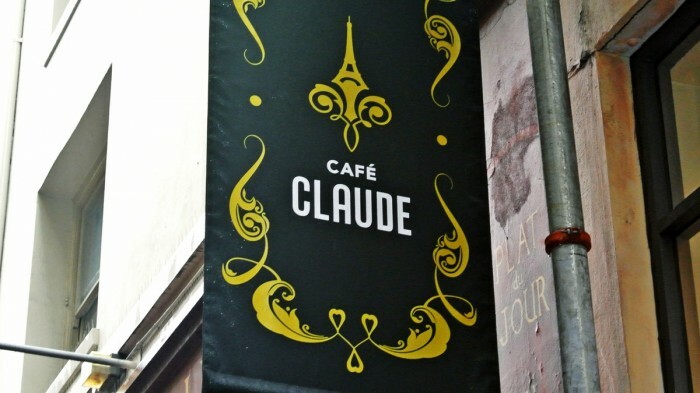 Café Claude, whisk me away to Paris! Café Claude is the type of place you would never find if you weren’t specifically looking for it. Tucked away on a side street back alley with basically no signage to direct you to the restaurant, it stays pretty discreet. But once you spot it and pass through the massive, awning-covered outdoor dining space you’ll be transported to a refined, upscale, authentic Parisian cafe. White linen tablecloths and dark wood are the name of the game here. In fact, I think all of the furniture was salvaged from an actual cafe in Paris. Since I was dining solo, I took a seat at the bar and looked over the menu even though I already knew exactly what I was going to order. 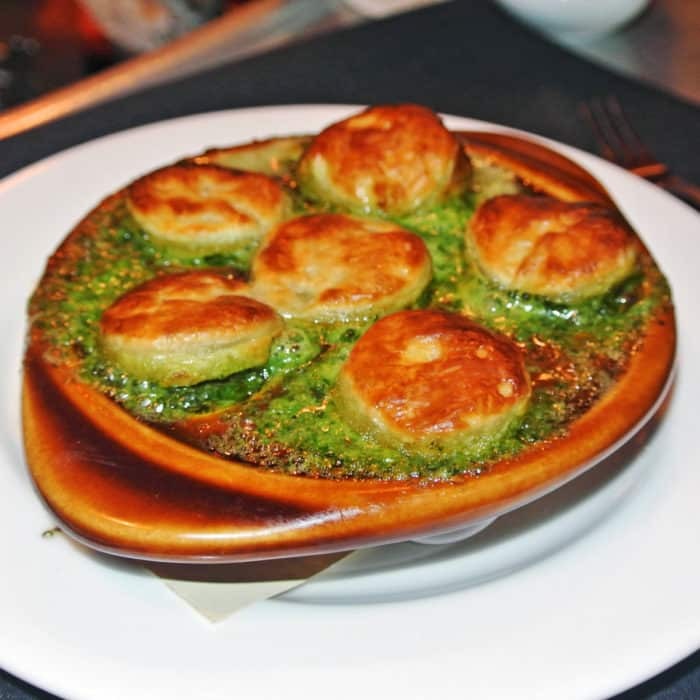 My Escargot En Croute appetizer arrived first and it was a sight to behold. I heeded my waiter’s warning and made sure not to touch the blazing hot ceramic dish that the alien-like creatures had been baked in. 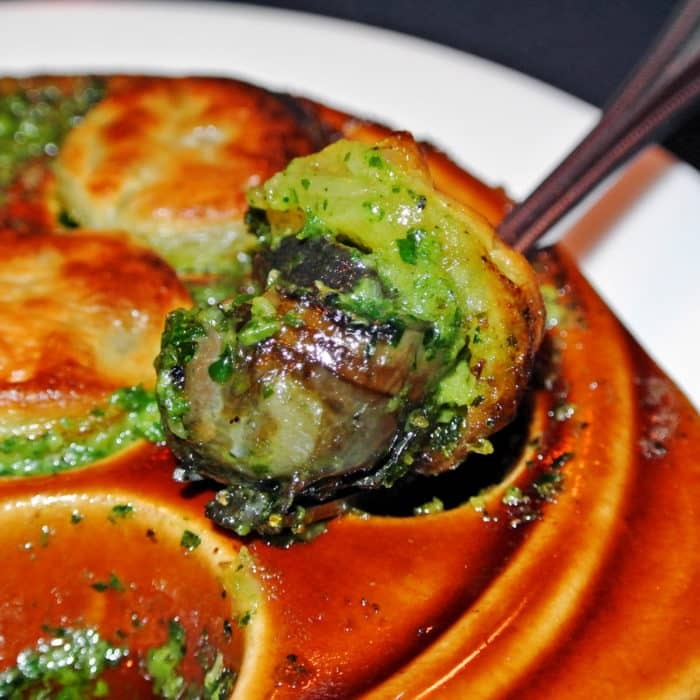 Each plump snail was blanketed with a disc of fluffy, flaky, layered puff pastry. And the entire platter was completely smothered in an bright, buttery, garlicky, green, herbal parsley, Pernod, shallot, and anchovy concoction. Every bite was piping hot and ridiculously flavorful. All of the bold and varied flavors and textures came together really nicely in this dish. 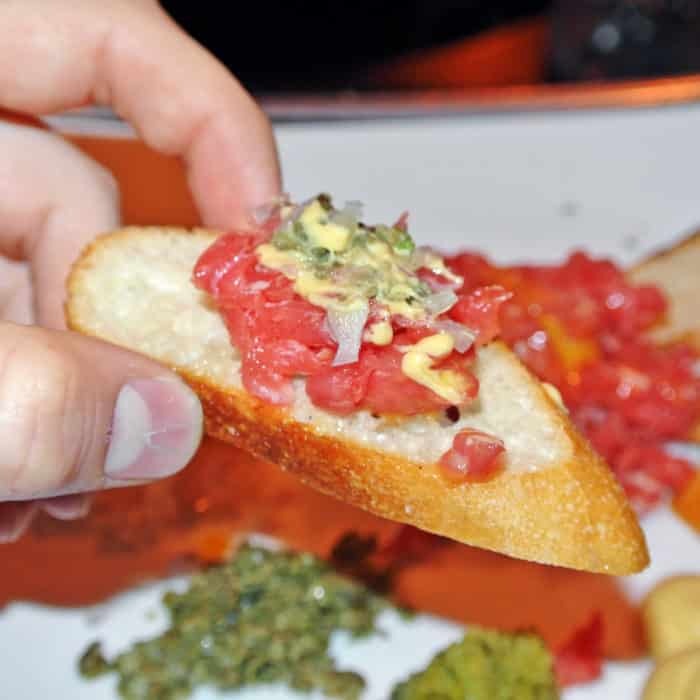 Soon after polishing off the sixth and final garlicky, herbal bite of escargot my Steak Tartare platter was presented to me. 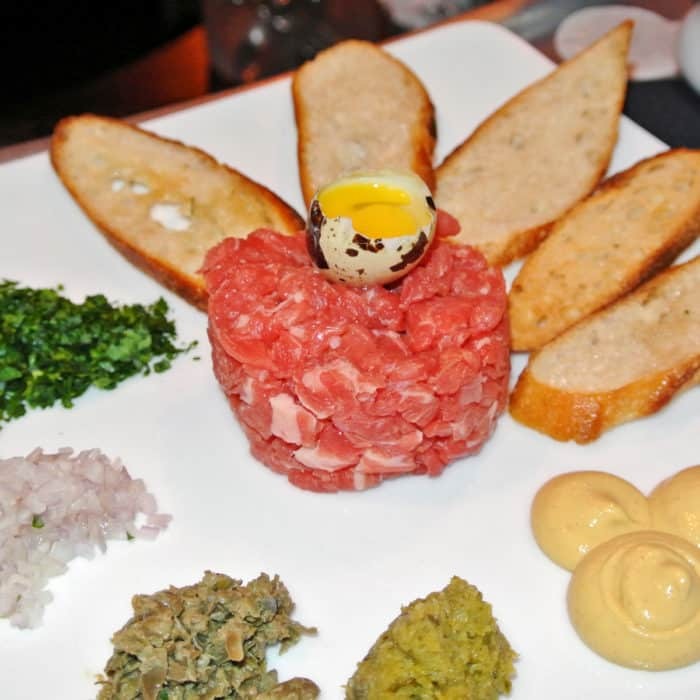 Out came a large, beautifully arranged plate with a cylindrical centerpiece of fresh, bright pink, thick cut, raw steak topped with a raw quail egg along with toast points and the usual tartare accompaniments of capers, cornichons, onions, parsley, and spicy Dijon mustard. This was quite a nice rendition of steak tartare which allowed me to take great, big mouthfuls of the gorgeous raw meat-loaded toasts with a bit of each of the condiments thrown into the mix. Personally, I love mixing egg yolk, onions, capers, and Dijon mustard to make perfectly flavorful and classic steak tartare bites like these. 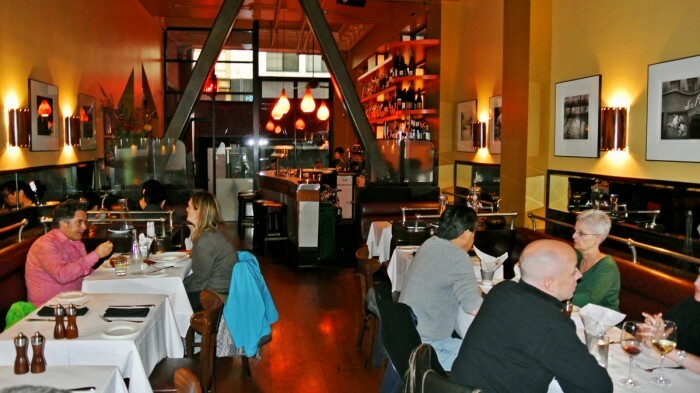 So if to get away on a Parisian excursion in San Francisco, make your way over to Café Claude. The food is fantastic and the environment and service is top notch. You’re bound to love everything about it. 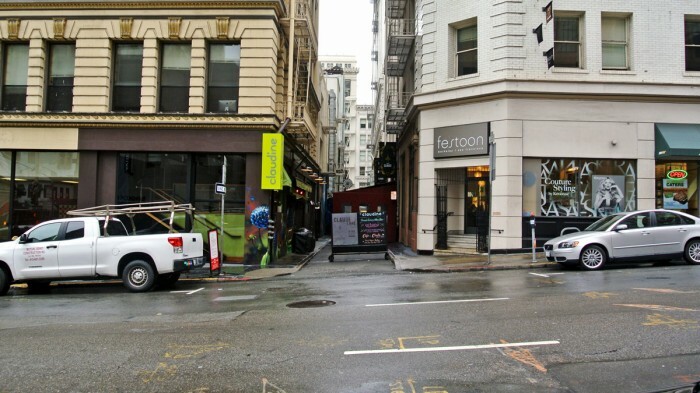 Got another great cafe in San Francisco I should check out? Let me know in the comments below. Outstanding Sustainable Seafood on the Sausalito Waterfront at Fish.